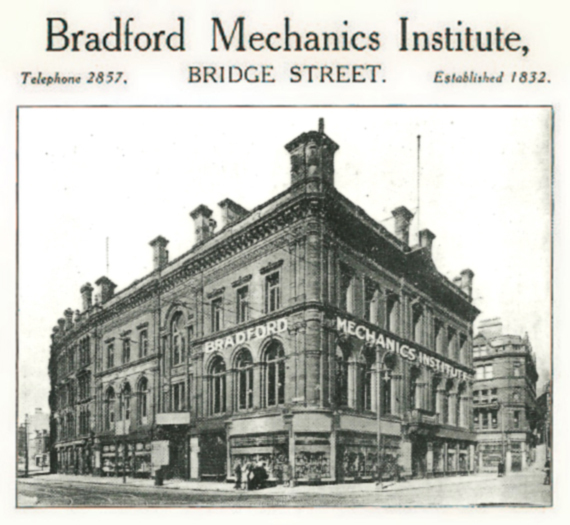 On 3rd September the Bradford Daily Telegraph reported that “the Citizens’ Army League was inaugurated at an enthusiastic meeting held at the Mechanics’ Institute last evening”. Similar local arrangements were being made in many other towns and cities across the country in response to Kitchener’s call to raise more men. 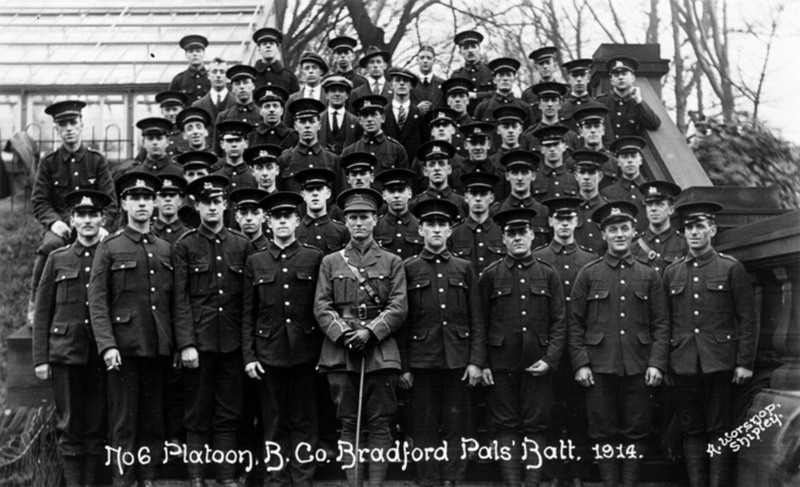 The League was to create a brand new Bradford Battalion, lasting for the duration of the war and quite distinct from the Territorials and the old Regulars. In an inspiring address, Sir George Scott-Robinson MP described the greatest crisis ever faced by civilisation. 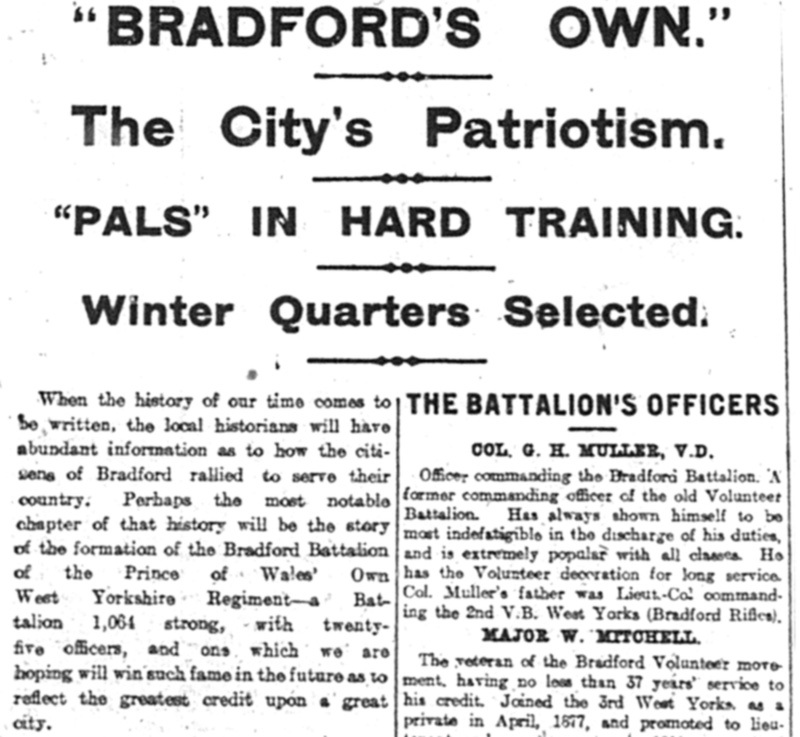 A long list of leading citizens, “putting politics aside”, formed a Committee to raise £7000 from the city to support a new Bradford Battalion. 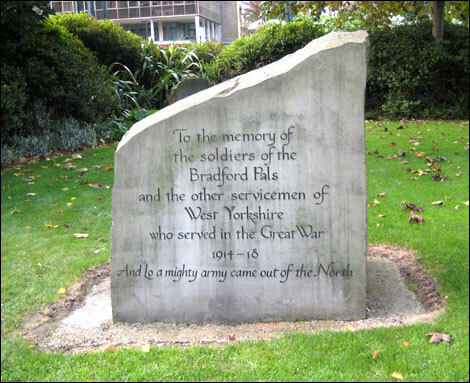 Despite many names being bandied around, the Telegraph made clear that it was a single battalion: ‘Commercial’, ‘Bradford Trade’, ‘City of Bradford’ were one and the same ‘Pals Battalion’. Recruitment for the regiments of the Regular Army continued briskly at the Labour Exchange but this new Battalion would have separate arrangements. The Council of the Mechanics’ Institute had voted to permit use of the Lecture Theatre and other offices at no charge to the city council. 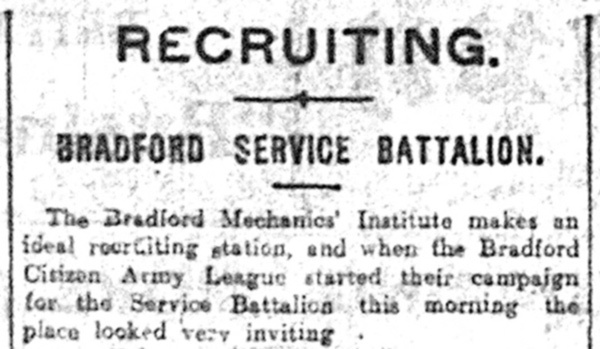 On 8th September the Telegraph declared it an “ideal recruiting station. It looked very inviting, being well equipped with recruiting and clerical staff.” Much emphasis was placed on the “special inducement, in that young men will serve shoulder to shoulder with their friends and colleagues in civil life.” Mr Philip Main Crowther, a 24-year old solicitor from Highfield Place, Manningham, was first to sign up. Two days later an analysis of trades and professions showed 106 occupations listed. 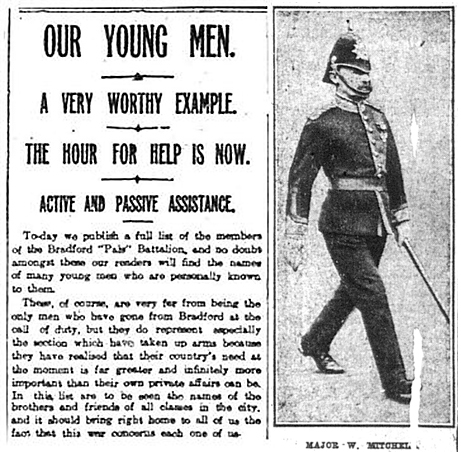 Over 1000 men attended the first drill in Manningham Park on 15 September but an estimated 10% would fall short of the height requirement. For a few weeks, in the absence of khaki, the men were wore navy blue uniforms and returned home in the evening. 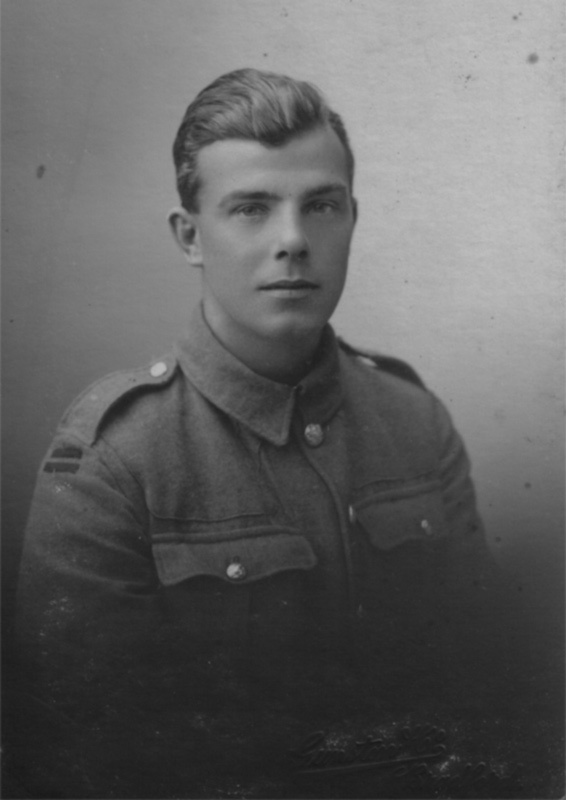 Winter quarters were found at Skipton and in Spring 1915 the men, now joined by an entire second battalion of Bradford Pals, moved to Ripon and later to Fovant in Wiltshire. War still seemed a long way off!